How much must 30-somethings save in their 401(k)s to prevent a decline in their living standard after they retire? No two people are alike, but the Center for Retirement Research estimates the typical 35 year old who hopes to retire at 65 should sock away 15 percent of his earnings, starting now. Prefer to retire at 62? Hike that to 24 percent. 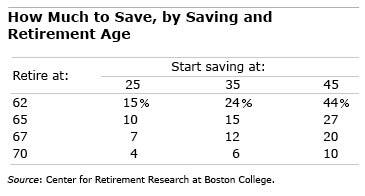 To get the percent deducted from one’s paycheck down into the single digits, young adults should start saving in their mid-20s and think about retiring at 67. These retirement savings rates are taken from the table below showing the Center’s recent estimates of how much workers of various ages should save to achieve a comfortable retirement; they represent the worker’s contribution plus the employer’s contribution on their worker’s behalf. Expressed as a percent of their earnings, they also vary depending when a worker retires. Millennial women may have higher expectations about their financial prospects than their baby-boomer mothers. But Millennial women, just like their mothers, are earning less than their male counterparts and saving less for retirement. The vast majority of single and married men and women, ages 22 through 33, said they recognize the need to save, whether as a defense against economic uncertainty or in response to the onus on each U.S. worker to prepare for his or her own retirement. A major reason cited for not saving is “not having enough money to save right now.” This is especially germane for women: for example, the median annual income for Millennial women is $45,000, while their male counterparts earn $61,000. Women, on the other hand, would make wiser choices about what they’d do with a $5,000 windfall: they’d be less likely than men to spend the windfall and more likely to save it or use it to pay down debt. Harris Poll conducted the nationally representative online survey of 1,600 Millennial households for Wells Fargo. In addition to single Millennials, married and single mothers were also surveyed, and child-rearing responsibilities likely reduced the incomes reported by women.